Kate Malvern just lost her job as governess and is staying with her old nurse Sarah until she gets a new situation. Sarah doesn't like the idea of her Kate, whose father was a gentlemen despite being a soldier and a gambler, hiring herself out to anyone who asks. Kate lived under all kinds of circumstances all over Europe so a little hard work doesn't bother her. Still, Sarah can't let it go so with the help of her crusty father-in-law, Mr Nidd, she writes to the only relative Kate is aware of, Lady Broome of Staplewood. At first, it looks like Lady Broome, or Aunt Minerva, is an answer to Kate's prayers, offering her a place to stay for the summer. Kate starts to feel uneasy when Aunt Minerva gives her lavish gifts. There must be a catch. Lady Broome doesn't seem like someone willing to give something for nothing. When she offers Kate a way to pay back her generosity, involving her handsome but unstable son, Torquil, Kate knows she has to get out of Dodge. Can she enlist the help of her other cousin Philip who thinks she's a golddigger? Or rely on her own witts to disentangle herself from Staplewood? 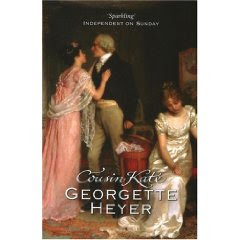 Every Georgette Heyer novel I read becomes my new favorite and Cousin Kate is no exception. I loved Kate right from the beginning. She's a practical girl with a sensible head on her shoulders. Plus, she's sassy. She can go toe to toe with Lady Broome and her machinations. She also manages to charm just about everyone in the Staplewood household. Lord Broome treats her like a daughter and Torquil is calmer in her presence. Lady Broome is sufficiently nasty without becoming cartoonish. The dialogue between Philip and Kate is the best I've read from Heyer yet. Their back and forth is a lot like Elizabeth and Mr Darcy. Philip never really gets the better of her. Cousin Kate is a fun story with an engaging plot. I wanted to know what the deal was with Torquil and what scheme did Lady Broome have up her sleeve. A cast of engaging characters added some humour to the story. There was nice mix of suspense and romance. Of course, I was never really worried that things wouldn't work out for Kate. This is Heyer afterall! I'm not usually a fan of historical novel, but this sounds interesting. Ooh! Want to read this! Have only read a few Heyer books, but they're all so good! I'll be reading this one soon so it's really good to hear that you liked it. I'll have to look into more of Heyer books. Oh good, I'm glad you liked it as a I have this one on ye old TBR. Oh this sounds like a gooder! Heyer is an author I just recently discovered and I've loved all 3 books I've read so far! I think it's because her female characters are so spunky. I like that she wrote most of her books before the 1970's, but she made her women feel very modern and independent. Ooh, glad you enjoyed this one!